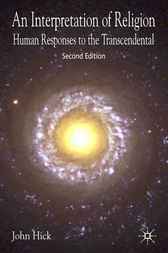 This very clearly written book provides a rational justification for responding religiously to our ambiguous universe and for seeing the major world religions as different culturally conditioned forms of this reponse. It is the classic exposition of the pluralist theory of an ultimate reality which is in itself beyond the range of our human concepts but which is universally present so that we can be aware of it in the various forms made possible by our own concepts and spiritual practices. These vary among the different ways of being human that are the cultures of the earth, giving rise both to the divine personae of the monotheisms and the metaphysical impersona of the non-theistic faiths. Based on Hick's Gifford Lectures, and receiving the Grawemeyer Award for significant new thinking in religion, the first edition gave rise to many critical discussions in journals and books. In this new edition, Hick responds to the major criticisms. JOHN HICK is a Fellow of the Institute for Advanced Research in Arts and Social Sciences at the University of Birmingham, UK and has taught at the Claremont Graduate University, California, the Universities of Cambridge and Birmingham, UK, Cornell University and the Princeton Theological Seminary. Among his many books are Faith and Knowledge, Philosophy of Religion, The Second Christianity, God and the Universe of Faiths, Arguments for the Existence of God, Problems of Religious Pluralism, Evil and the God of Love, Death and Eternal Life, Disputed Questions in Theology and the Philosophy of Religion, The Metaphor of God Incarnate, The Fifth Dimension, Dialogues in the Philosophy of Religion and John Hick: An Autobiography.